We never want to miss an important event in our life and so we always note them down somewhere on a calendar whether it be online or on a paper. With lot of things happening around us we certainly like to stay organized, plan efficiently and hit those important dates. With calendars now available on mobile and internet we have a choice to interact with them anywhere. I am no exception to a person nowadays using such calendars. It’s really a luck that I am working on Sitecore and that too when the Sitecore Community is blossoming. Tracking all Sitecore Community Events gets me on the edge of knowledge and updated so I always pin and try to follow the events. The problem was, I have to visit different sites, engage on social media to know about the Sitecore events. This made me thought why can’t I have all Sitecore Community Events noted at one place. Are you thinking on the same line? 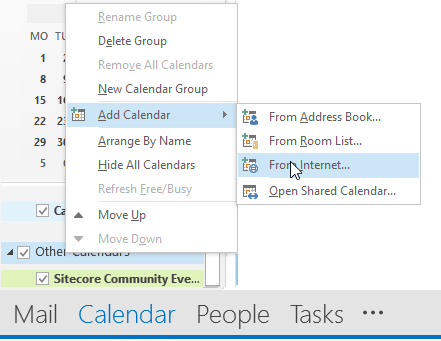 You can even import this calendar to your Microsoft office outlook using “From Internet” option.